. Legends about Fudo お不動さま - 不動明王 . "Hachiman Gudokun" is a history of temples and shrines that narrates the miracle and divine virtue of Hachimanshin (Shinto god of War) which is considered to have been compiled in the middle or late Kamakura period. The Mongols brought an advanced technology weapon that terrified the Samurai. It was an early form of "shock and awe". In addition to their clouds of arrows fired continuously, the Mongols also brought explosive Chinese bombs. 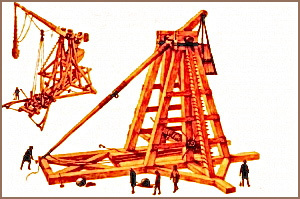 These bombs were flung from Trebuchets. "The commanding general kept his position on high ground, and directed the various detachments as need be with signals from hand drums. But whenever the Mongol soldiers took flight they sent iron bomb shells flying against us which made our side dizzy and confused. Our soldiers were frightened out of their wits by the thundering explosions, their eyes blinded, their ears deafened, so that they could hardly distinguish east from west." These "mighty iron balls" were flung and "rolled down the hills like cartwheels", they sounded like "thunder" and when they exploded "looked like bolts of lightning". The Mongol shock tactics definitely worked in the opening engagement between the two armies. Empress Jingu (traditionally 169-269 CE) is a legendary figure, appearing in myths of the gods in the earliest chronicles of Japan, the Kojiki (712) and the Nihon shoki (720). According to these accounts, she was a shaman as well as empress and the vessel through which the gods made known their will to the emperor. At Emperor Chuai's death, she took up the divine mission bequeathed to her husband and organized an invasion of the Korean peninsula, calling on the gods whenever her goal was frustrated. She returned triumphant to Japan, bore a son, and ensured his succession to the throne through her own period of rulership. Though the paucity of historical evidence has led to various theories regarding the story's factual basis, its importance as a legend is evident from its appearance and reinvention through over a thousand years of Japanese history. This thesis charts what may perhaps be considered the first phase of that reinvention. In the later classical and medieval periods of Japan, Jingu's son, Emperor Ojin, was identified with Hachiman, a local god of increasingly central importance and an emblem of syncretic religious traditions within Japan. With the growing importance of Buddhism, both Hachiman and his mother were reimagined with Buddhists elements in their histories. Focusing on the Hachiman gudokun, a shrine-temple origins account written in the first decades of the fourteenth century, this thesis charts the developments of the Jingu narrative in various documents of the medieval period. Highlighting three key roles of Jingu's character --ruler, shaman, and Buddhist-- I show how the Hachiman gudokun presented a version of Empress Jingu's story revitalized by contemporary developments in Buddhist and political thought, paving the way for the powerful martial image of Jingu that emerged during the Meiji Period.
. - Join Fudo Myo-O on facebook - Fudō Myō-ō .
. Empress Jingu Kogo 神功皇后 . 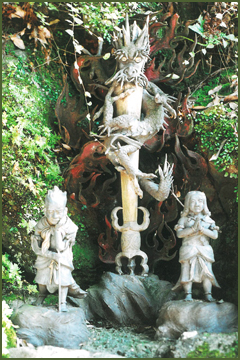 Fudo Myo-O Junrei - Fudo Pilgrims .
. Waterfalles named "Fudo no Taki" 不動の滝 . Yuhidaki is a 30 meter waterfall located in Yamada Town in the northernmost part of Shuzenji Town in Izu City, Shizuoka Prefecture. It flows down in two stages; the upper stage is 20 meter tall and the lower stage is 10 meter tall. The white lines of water flowing down on the columnar joint rock surface, which is typical to this region, are very beautiful. 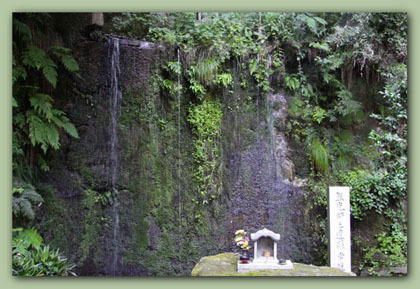 The statue of Fudo Myoo is enshrined beside the bottom of the waterfall. Double-flowered cherry trees that come into bloom in late April and hydrangea flowers that line the walking trail down to the basin in June offer wonderful color contrasts to the waterfall. In winter, on the other hand, the dashing flow of water freezes to create beautiful ice pillars. You will feel as if time has stopped when you see the sharp tips of ice plunging from above your head and protruding toward you. Click for more photos !
. Legends and Tales from Japan　伝説 - Introduction . 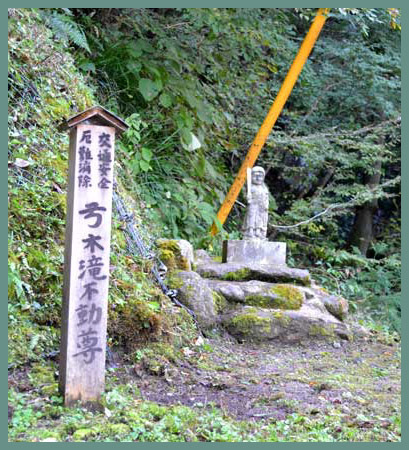 日高郡 Hidaka district 龍神村 Ryujin "Dragon Deity"
At the waterfall Yumiki no Taki 弓木の滝 / 弓木滝 Fudo Myo-O is venerated. If people throw impure things into it, like feces of cattle, the mountain will move, the valley will shake and a strong rainstorm will come. This is the doing of 滝の主 the Lord of the Waterfall, a huge serpent. 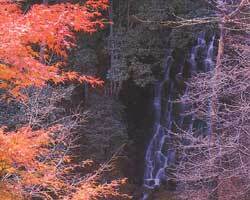 The 赤滝の不動様 Fudo from Akataki "Red Waterfall" has special powers to heal eye disease. Sometimes he changes into 大蛇 a huge serpent and people who happen to wintess this are cursed. Therefore all are quite afraid of this place.
. Waterfalls and Fudo Myo-O . While a monster was grilling mochi 餅 rice cakes, a 鯖売り vendor of mackerels hid in the ceiling and picked them up from there. The monster thought, 火の神さま the God of Fire or Fudo Myo-O, has eaten them all. Now the monster wanted to drink some hot Sake rice wine, but the mackerel vender stole the bottle too. Again the monster thought, 火の神さま the God of Fire or Fudo Myo-O, has drunk it all.
. saba 鯖と伝説 Legends about mackerel, Makrele .
. Fudo Ryuma Dragon Horse 不動 龍馬 and the Kappa . In the hamlet of 柳原集落 Yanagihara they did not have a lion head mask for the bangaku 番楽 Kagura dance. 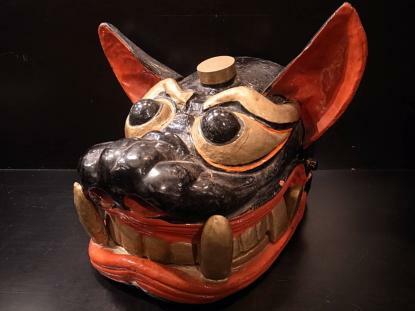 Around 1890 the villagers of the hamlet 稲沢集落 Inazawa tried to steal a lion head from Yanagihara, but he died, and the person he gave the lion head to died also. They gave the lion head to 不動堂 the Fudo Hall, put people visiting the Hall died also. The Lion Head must be cursed and all were quite afraid to come close to it. One farmer then carved a dragon statue and they gave the lion head back to Yanagihara. bangaku 番楽 is the local word in Akita and Yamagata for 山伏神楽 the Kagura dance of the Yamabushi mountain priests. It has kept many old traditions. 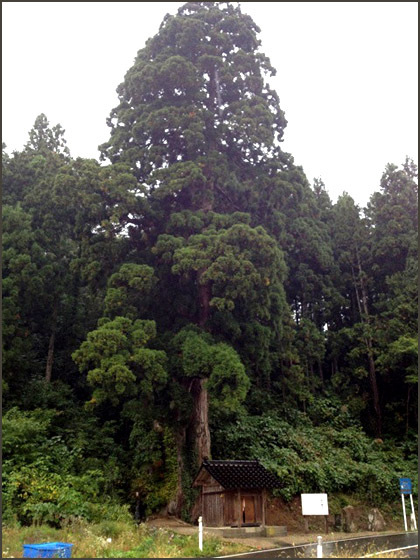 Once upon a time someone cut down the sacred cedar tree of Fudo. When Fudo wanted to come down and rest on his tree, he found it gone and was very sad and angry about it. The man who cut it down and the man who bought the wood both became ill. River Mogamigawa, where the stem was floated down to Sakata, begun to swell and flooded the town. A monster was once roasting mochi rice cakes, when a vendor of mackerels 鯖売りpassed by. He sneaked to the roof and stole them all. The monster thought maybe お不動さま Fudo sama or 火の神 the Deity of Fire had eaten them. So next he began to make hot sake. The vendor stole them too, but the monster again thought Fudo sama or the deity of fire had drunk it. At the hut near the charcoal kiln 炭焼き小屋 above the Fudo Hall someone killed a cat and ate it. He then became seized by the Inari fox 狐. A younger brother had to move away from the family estate and came here. At the Fudo Hall he had a vision: "Do you want a hot spring or to you want well water?" He decided to ask for well water and indeed, a clean well was found right beside his new home. A servant went out cutting the weeds in the morning and did not come back. When asking the oracle at the temple Fudo-In the answer was - he had been possessed by a fox. They made offerings of ritual rice at the back of the mountain to appease the fox. And about five days later, the man was found safe at the border of the village. 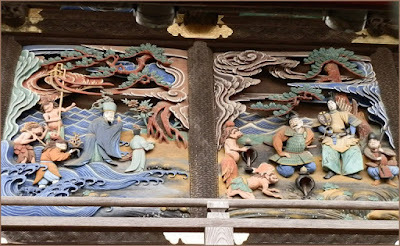 A family did not take good care of 不動尊の掛軸 a hanging scroll of Fudo and suddenly all became ill. So they gave the scroll to repair and then prayed in front of it every day.
. Shōnai 山形 - 庄内　- 伝説 Shonai Yamagata Legends .
. Ablutions at 月山 Mount Gassan . When Hachiko, the founder of the Haguro temple, made a ritual fire, Fudo Myo-O appeared to him, wielding his sword and dripping his blood on gomagi 護摩木 the ritual wood. The blood became a flame, getting higher and higher. Other versions say that the founder Hachiko obtained a sacred ball of fire and a ball of water and buried them at 荒澤 Kotaku. "the Hall of perpetual, sacred fire"
at the temple 荒澤寺 Kotaku-Ji at Mount Haguro, is the place where mountain priest 蜂子 Hachiko, the founder of Haguro, trained himself in mountain asceticism. The flame has been burning since his time. About 30 years ago, the child of one of 不動講 the Fudo Prayer Groups member became a stomach ache and its belly was swelling rapidly. At the hospital they had no explanation and no diagnosis for this, but the child got worse and worse. Monjin Sama e iku yoo ni モンジンサマへ行くように Go to Mister Monjin ! Y．M. の家を訪ねろ Go to the home of Mr. Y.M. The child of this home was seriously ill, but even exorcistic rited did not help. They tried to put some water into the mouth of the child, using 紙縒 a string made from twisted paper. Now siddenly the pulse became visible on the arm again. Mister Y. M. was greatful the gods had helped his child. He followed the advise of the group leader and made water ablutions for one week. By the end of this time, the child was almost cured. When 渡辺四郎 Watanabe Shiro was about 19 years old he said on a fine day "We have to cut the mulberries, because it will rain tomorrow." Nobody believed him, but it happened this way. And a few more times he could see the future. People soon came to see him and ask o-ukagai オウカガイ his oracle advise from his estate deity, Fudo Myo-O. The Shinto priest 羽田吉章 Haneda Yoshiaki made an offering of a stone sanctuary for Yamato Takeru and they could have a 石占 stone oracle there. While Shiro san was away in the war, his wife took over with the stone oracles.
. Prince Yamatotakeru 日本武尊 .
. toigiki 問い聞き / 問聞 / トイギキ oracles . hotokeoroshi, hotoke oroshi ホトケオロシ / 仏オロシ "calling a Buddha to earth"
kamioroshi, kami oroshi カミオロシ / 神おろし / 神降ろし "calling a Kami to earth"
Rituals for seeking spiritual, religious help through a medium.
. Gonzaburo Fudo 権三郎不動 . 笛吹川 River Fuefukigawa "River where the flute was played"
On the way from 梅ヶ島 Umegashima toward 古谷城 Odani castle there once walked a woman, suddenly shouting in pain and then disappeared. At this place there is now a small sanctuary for Fudo Myo-O. Once there was a huge flooding and and the waterfall changed its course. In the water of the flooded fields something was shining. When the farmers pulled it out, it was a statue of Fudo Myo-O. They built a small sanctuary to pray for it. The sanctuary later burned down but the statue was rescued in time. 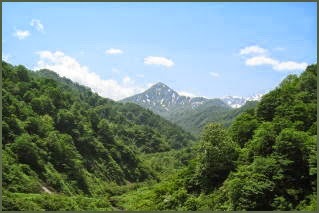 the plain of Mount Asosan 阿蘇の盆地 . Once there was a bad fishing season in the village and the local Lord had to borrow food for the people. Then he forgot to pay it back. Anyway, when they next went fishing there was a statue of 波切不動 Namikiri Fudo caught in the nets . Once there was a beautiful princess called おまる姫 O-Maru Hime at the home of a certain 吉田 Yoshida of the Amako clan. Every night a young man came to her quarters. He never made a sound and that was very strange. So the Lord ordered his retainers to follow the young man. He went to the basin of the Fudo waterfall 不動の滝壷, became a dragon and disappeared in the water. Oh dear, that was quite a terrible shock and now the father ordered the princess to stay in confinement. But she became terribly love-sick for her young man. So they brought the princess to the waterfall and she jumped in before it could be prevented. Her mother was so very upset that she called upon her to show her figure just once more. So the princes, turned into a dragon, came up once again. Now her family gave up on her and threw a bottle of sake rice wine into the waterfall as an offering. This was on the first day of the sixth lunar month, so now there is a festival for Fudo Myo-O on this day. A similar story is also told in 恵庭郡 Eniwa gun 新座村 Shinzamura.
. benjogami 便所神 / 厠神 Deity of the Toilet . In some villages of Okayama the Deity of the Toilet is called 不動様 "Fudo Sama". For example in 真庭郡 Maniwa district, 久世町 Kuse and 阿哲郡 Atetsu district 哲西町 Tessei.
. Misaki Densetsu　岡山県のミサキ伝説 Misaki Legends from Okayama . about a deity that can bring misfortune or curses.
. 栗原不動寺 Kurihara Fudo-Ji and the Misaki . The 淡路小聖 saint from Awaji became afraid about his love for the lowly 志津 Shizu and hid in the mountain of 犬鳴山 Inunakiyama. She followed him and came closer, when she almost saw him he was suddenly covered in white clouds and became invisible. These clouds were formed by the power of Fudo Myo-O. Shizu walked and walked in the mountain, loosing her wy and finally freezing and starving to death. The villagers later build a temple to appease her soul. To our day, when clouds gather on the mountain and it begins to rain, villagers call this 志津の涙雨 Rain is the tears of Shizu. 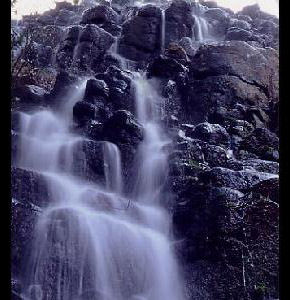 The nearby waterfall is 志津の涙水 Water as the tears of Shizu. If people take some of this water home and take a sip every day, eventually their wishes will be fulfilled. Nearby is 志津地蔵尊の御堂 a Hall dedicated to Shizu Jizo. 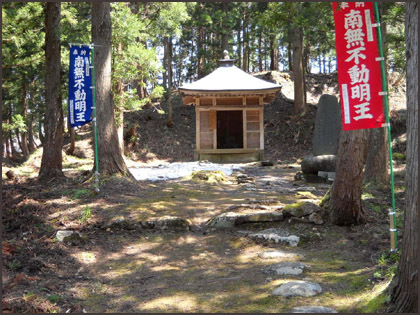 Here Jizo will grant one wish to each visitor.
. Inunaki san 犬鳴山 and Kurikara Fudo . Once a hunter was after a deer when his dog begun barking and the deer had a chance to escape. Angry at the noisy dog, the hunter killed him on the spot. But then he saw that the dog had been trying to warn him of a huge snake nearby, coming closer. This good dog had been the messenger of Fudo Myo-O. Great-grandfather went to Kawagoe Fudo every month on the 28th day. One day he got up early, but somehow got lost on the way in the mountain. Then he remembered that this was a path where foxes cross. He took his flint stone and made a small fire to spend the night. Next morning he found he had been walking in circles in the mountain - bewitched by a fox maybe ?! The Naritasan Kawagoe Betsuin Hongyoin Temple is familiar to Kawagoe natives as "Ofudo-sama." If you pass through the north gate, you will find a small pond with many tortoises on your right. Small children enjoy watching them. This "Ofudo-sama" is the Kawagoe branch of the Naritasan Shinshoji Temple in Narita City, Chiba prefecture. Let's look at the history of this temple. ... In 1853, when Commodore Perry's four black warships came to Japan from America, more than ten Kawagoe citizens did their best to obtain permission from Kawagoe's Lord MATSUDAIRA Yamatonokami to restore the Hongyoin Temple. The temple lay in ruins in Kubo-machi but they wanted to restore it as a branch of the Naritasan Shinshoji Temple and transfer the Acala temple to the ruined temple site. In 1873, a new main building was constructed and the next year a special service to inspire the Acala spirit was performed. On the site of the Naritasan Kawagoe Betsuin Hongyoin Temple, there is a large votive tablet describing how the construction of the temple proceeded. We assume that it was offered by the carpenters in 1874. The paint is now discolored but we can still see five woodcutters, sixteen people transporting rectangular pieces of lumber and two carpenters shaving wood with hand axes. When I was a child, there was a long bundle of hair near the tablet. I heard that during the construction of the temple, female believers cut their hair and offered it to the temple as a prayer for completion of the temple building. It seems that a long bundle of hair was very effective as rope in a time when there were no crane trucks. Thinking about those women who cut their hair, I felt a lump in my throat every time I looked up at the bundle of hair. - - - - - Kawagoe is also famous for its Daruma market.
. Temple Kita-In Kawagoe 喜多院、川越 .
. Oonyuudoo 大入道 O-Nyudo Monster . 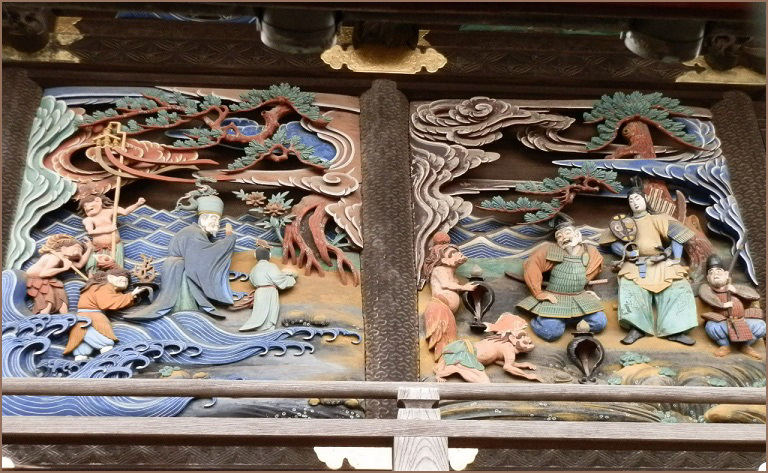 The 竜門寺の不動 Fudo from Temple Ryumon-Ji disappeared every night, went down to the village and disturbed the people. Eventually a brave samurai cut off his hands. He is now known as 手なし不動 "Fudo with no arms".
. Ennin -　Jigaku Daishi 慈覚大師 / 慈覺大師 . Expecting some water damage from rain, people came to the Fudo statue of 多羅尾 Tarao to pray. They saw a huge serpent lying down and not moving, but becoming bigger and bigger as they looked. When they came home, they realized that indeed a huge damage from water occured. A man from the members of temple 不動寺 Fudo-Ji left for a pilgrimage to 伊勢 Ise but never came back. The villagers asked another itinerant Fudo Pilgrim for his advise. He told them to look in the Eastern direction of the shrine, up in the forest. When they searched the area, banging drums and gongs, they found his coat hanging on a tree. Another version tells of a man being kidnapped by a Tengu san 天狗さん and hung up in the tree. At a place called 経平 Tsunehira there was a small Shrine, but it was lost during a huge mountain slide. After that, every night there was a light to be seen. In March of the year 1681 local farmers begun to dig there and indeed, they found a wooden statue of Fudo Myo-O. When a spirit Buddha statue begins to sweat, it is usually the indicator of something bad (or good) to happen. The Fudo statue at 生駒山般若窟 the Hanya Cave on Mount Ikuma is sometimes sweating, and for sure, a disaster will happen.
. asekaki Fudo 汗かき不動 sweating Fudo .
. Ikomasan 生駒山 宝山寺 Hozan-Ji . Once there was a priest who worshipped Fudo Myo-O diligently with morning and evening prayers. The statue goes out to help a nun who did not have proper funeral rituals about 20 years ago.
. En no Gyoja 役行者 and Fudo Myo-O . If someone throws the statue of a Fudo Myo-O into the nearby river pool, it will begin to rain during a drought. At the waterfall 不動が滝 Fudo-ga-taki in Muro village there was a tea stall. Once a beautiful lady came to get some ame-mochi 飴餅 "sweets rice cakes". The curious shop-owner asked her where she had come from, but she did not answer. Later he followed her footsteps and found they disappeared in the basin of the waterfall. Since then, these Mochi became a speciality of the tea stall.
. mochi 餅 rice cakes - Introduction . As the lord of 不動淵 the Fudo Riverpool there was a Kuchinawa serpent. When a farmer tried to drive it away and threw some toilet dirt into the water, something like a golden bird flew up into the sky.
. shichininzuka 七人塚 mound for seven people - Introduction . On the top of 不動山 Mount Fudoyama there is a statue of Fudo. In the morning of April 25 the followers climb the mountain to pray and make offerings. At least once in a lifetime followers should climb that mountain. This Fudo will heal diseases of the eyes 目の病に効く. During the great earthquake in December 1833, the statue of Fudo in the temple 大照院（大正院）Daisho-In rolled out of the temple building. The people inside followed him in a hurry and all went out - just in time before the building collapsed. Fudo had saved them all.
. Nonomi no Ike 野々見の池 and Ikejiri no Ike 池尻の池 .
. Fudo and tanishi 田螺 mud snails. .
. oogon no niwatori 黄金の鶏 the golden rooster .
. Miyagi prefecture　宮城県　- お不動さま　. The priest from the Shrine 生田山愛宕神社 Ikuta Atago Jinja, 長友清市 Nagatomo Seiichi （1869 - 1961) performed rituals to get rid of spiritual possessions. He used to recite the spell 不動のからすばり Fudo no Karasubari, which made the possessing Yokai afraid and leave the human body. But eventually priest Seiichi became insane himself, left his estate and went to the Shrine, where he fell to the ground. When he came back to his senses, he realized that the possessing spirit had left. 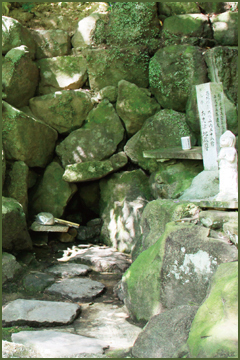 Once a pilgrim went to 伊予山 Mount Iosan and made ablutions in the waterfall, when suddenly Fudo Myo-O appeared. Fudo let an old hag with a wide mouth, from ear to ear. When she opened her mouth, flames came out of it. Once the head of the family did not feel very well and when ホウザンハン a Yamabushi priest came to purify the hearth, he was told that the Hearth Deity was not properly venerated. When the family had replaced the hearth, they did not call a priest to have rituals for Fudo, but called 宮司さん a Shinto priest. If they had not even called the Shinto priest, all family members might have died.
. kamado 竈 hearth and its deity . 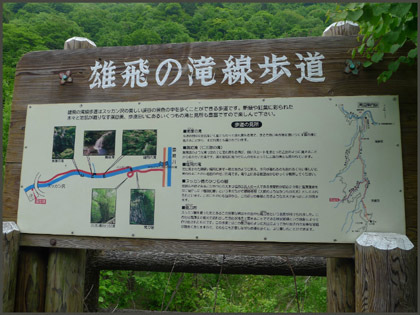 The road from Tsuga to the Fudo sanctuary has a curve called ヒウチカド Hiuchikado. People get posessed by a Tanuki there. Once a charcoal maker passed by this 不動さん Fudo San. It was a full-moon night, but here al was pitch-dark. So the man wend down on his knees and grabed the weeds by the roadside to find his way. Eventually he crossed the bridge and suddenly the night was light again. And he heard someone laugh devilishly. This was the deed of a Tanuki, a kind of Yokai called Ao-Nyudo, the Blue Nyudo monster. 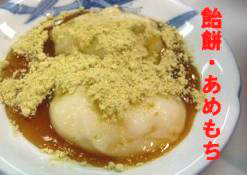 If people are possessed by a fox or Tanuki, they get abura-age 油揚 fried Tofu or 小豆御飯 rice with soy beans to appease them. The mountain priest 角田氏 Kakuda attacks them with Sutras. If they do not let go, he uses Fudo no kanashibari 不動のカナシバリ a paralyzing spell of Fudo to get rid of the possession. If they promise to let go, he reads 般若心経 the Hanya Shingyo Heart Sutra at the end of the ritual. - as practised by the Sogobujutsu martial art. When Kobo Daishi made ablutions at this waterfall, suddenly Fudo Myo-O appeared to him, hence the name. In the hamelt of 上出水 Kami-Izumi in the estate of 徳重義信 Tokushige Ienobu the deity Hanaya Don is venerated beside Fudo Myo-O. During WWII, the uncle of Ienobu had been in 満州 Manchuria. Ienobu had a dream of the uncle telling him to build a more beautiful sanctuary for Hanaya Don. So now it is a beautiful small shrine. If a traveler passes by 不動明 Fudo Myo, he falls from his horse. To show his respect, he has to demount from the horse and walk past. 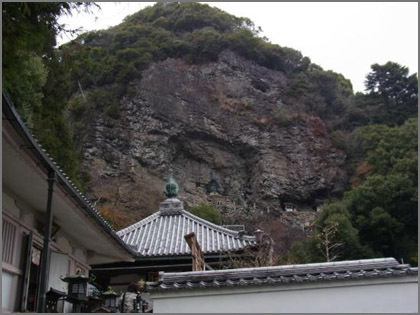 Once the Fudo statue at Oyama was found to be heavily sweating, then a strong earthquake occurred and many people died. Some Buddha statues are known to sweat. 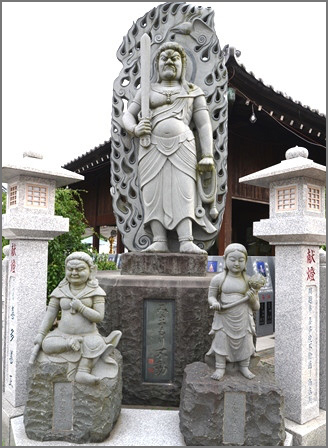 Once the high priest 智興阿闍梨 Chikyo Ajari was stuck with illness, the Statue of Fudo wept. These compassionate statues are really to be praised.
. 大山の不動様 Oyama no Fudo Son - 大山寺 .
. asekaki Fudoo 汗かき不動 sweating Fudo .
. naki Fudo 泣き不動 / 泣不動 weeping Fudo . Enkan was called for questioning to the Kamakura government because he was under suspicion of having done improper rituals (choobuku 調伏 Chobuku). The regent, 北条高時 Hojo Takatoki (1303 - 1333) had a dream: From the slope 東坂本 Higashisakamoto there came a few thousand monkeys to protect the body of the saint. So Takatoki ordered to postpone the questioning and told his subordinate 佐介時弘 Sasuke Tokihiro to do so. Tokihiro reported that on this morning, in the room of the saint, he had seen the shade of the figure of Fudo Myo-O. Enkan was born in 1281 in Omi. He became a priest at Enryaku-Ji in 1295 at the age of 15, and received jukai ordination at the precepts-platform of the same temple, when he was granted the name of 伊予房道政 Iyonobo Dosei . In 1303 he went into retreat and became a Zen priest for a while, but in the following year he returned to Kurodani. In 1305 he secluded himself for the second time, following　priest 興円 Koen, and together they sought the "revival" of the precepts. Enkan and his followers conducted their "revival" receiving an impetus from the actions of Eizon. 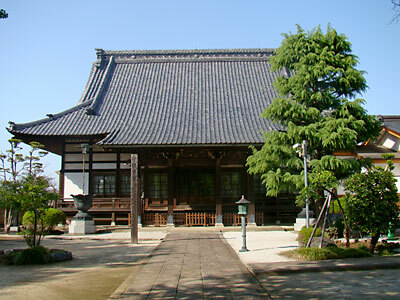 Enkan became a 遁世僧　tonseiso from the Hiei group, and the leader of the　fundraiｓing for Todai-Ji. He carried out important activities such as the "revival" of temple 法勝寺 Hocho-Ji. Enkan was in charge of the compilation of the original Taiheiki 太平記 records.
. Chōbuku hō 調伏法 Chobuku rituals . to ward off evil spirits, enemies, and malicious influences. After the war the leaders of 御岳講 the Ontake Mountain prayer group of 大岡 Kami-Oka held a lecture. On their way home in the dark some black soldiers belonging to 占領軍 the Supreme Commander for the Allied Powers grabbed the High Leader, strangled him and demanded money to let go. The High Leader begun mumbling the paralyzing spell of Fudo and in no time the black soldiers were paralyzed and unable to move. Once a family had a string of bad luck, so they went to a Fudo temple to ask what was the matter. They were told that a grave on the way to the mountain was not kept properly and they should hold rituals. This was the grave of a family member that was split as a bunke 分家 branch family. The branch family had moved away to Kanagawa. So the main family gave them a handful of the earth of the ancestors to place in a grave in the new home and indeed the bad luck was stopped. When the villagers performed a rain ritual at the waterfall of Fudo, there appeared a white snake and a red snake, telling them their wish would be granted. The snake is an incarnation of Fudo. A pregnant woman got ill and prayed to Fudo Myo-O, because a shaman had told her to do so. But the illness got worse instead. When she consulted another shaman, they found out it was a fox causing the illness. This shaman was a specialist in Yako Fox mischief. Anyway, the woman was healed and the child turned out to be very clever.
. Abe no Seimei 安倍晴明 and a weeping Fudo - 清浄華院 Shojoke-In .
. Shuten Dooji 酒呑童子 Shuten Doji "Sake Child" Demon . The vengeful spirit of Lady Rokujo was finally appeased when a priest at 横川 Yokogawa read the Sutra of Fudo (dokushu 不動読誦) many times for her soul.
. Rokujo no Miyasudokoro 六条御息所 . Shortly before his death, Fudo told priest Ryuusen 隆暹 Ryusen in a dream that he would soon go to paradise. 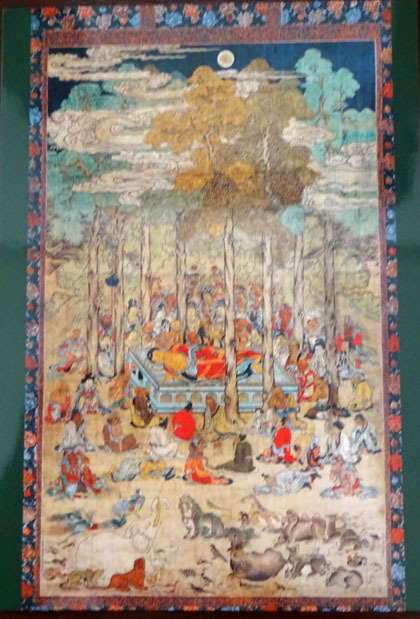 The painter Densu painted a Nehanzu 涅槃図 Nirvana scene of the death of Buddha. But it was a painting full of wonders. When he painted a dragon, the dragon would fly to heaven. When he painted Fudo Myo-O, his flaming halo would begin to burn in flames. Once he wanted to paint a dragon and prayed to the deities to show him one. Suddenly the water in the pond of the temple begun to churn and a dragon showed his features. 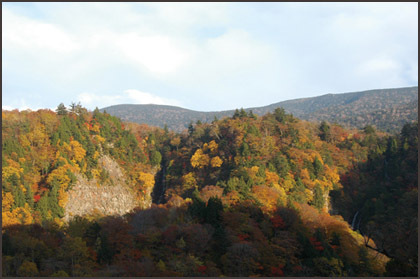 The colors and pigments for his paintings were from a special source at 稲荷山 Mount Inariyama. 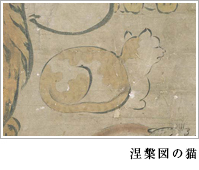 While Densu painted the Nehanzu scene, a cat came along with a brush and pain in its mouth. So he painted one cat into the scene.
. nehanzu　涅槃図 painting of a Nirvana Scene . The priest of the temple 清滝不動院 Kiyotaki Fudo-In, 青龍住職 priest Seiryu, had frequently chased something like a Tsuchinoko from the temple compound. Even visitors had seen the creature. They all helped searching, even along the deep slopes, but could not find it.
. tsuchinoko 槌の子 / nozuchi 野槌 Hammerspawn . kikusui no taki 菊水の瀧 Kikusui Waterfall "Chrysanthemum water"
The precious dew of the chrysanthemum leaves had turned into 甘露 honey dew and a 妙薬 miracle medicine, thanks to the grace of Fudo Myo-O. If someone can drink this dew mixed in the water of the waterfall, he will live to become 500 years. There are other waterfalls with this name in Japan. 常磐不動の滝 Tokiwa Fudo no Taki. The statue venerated there is said to have been made by Lady Tokiwa herself.
. Tokiwa Gozen 常磐御前 Lady Tokiwa . wife of Minamoto no Yoshitomo. (1123 - ?1180) - Mother of Minamoto no Yoshitsune. Search all the BLOG entries !